Repeat row 11 until bib measures about 8 to 8.5 inches from cast on edge. 2. Cap in photo was knit with Red Heart Super Saver Perfect Pink. 3. 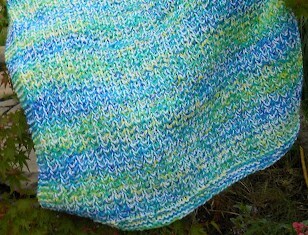 When you do the lift and purl work into the side of the stitch that leaves a hole, not the side that twists and closes. 4. I have done the 3 needle bind off both on the right side and the wrong side. I can’t decide which I like best. You will have to try it and see what you prefer. In this photo you can see the difference in the two. The top one is done on the right side the bottom is done on the inside. Cast on 48, (54) sts. Place marker and being careful not to twist your stitches join. Knit until cap measures 6.5 (7) inches from cast on edge. Turn cap inside out, (or don’t turn) transfer half of the stitches to another needle and work a 3 needle bind off to join the top of the cap. Wind the yarn around the DVD case (the short way) 25-30 times. Cut the yarn. With a piece of yarn about 10 inches long, thread yarn through the tapestry needle and pass the needle under all the loops. Tie the end of the yarn firmly around the loops. Tie a second time. Slide the yarn off the case and cut the loops opposite the tie. Cut another piece of yarn and tie around below the fold and fasten securely, hide the ends inside the tassel. Use the ends of the 10 inch strands to sew the tassels in place at the top corners of the hat. Trim the tassel ends neatly or leave loops uncut.